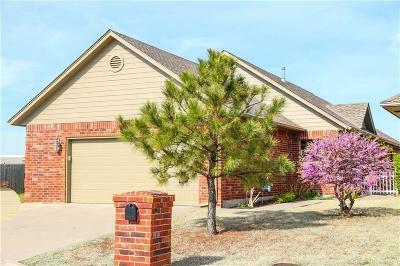 1109 Golden Leaf Drive, Moore, OK.| MLS# 862097 | Oklahoma City Real Estate | Apple Realty, Inc. Luxury patio home (zero lot line) in gated community... a rare find in Moore! Above ground safe room, minimal lawn care, and enclosed porch! Inside is where this home really pops! Crown molding around 9 foot ceilings, oak cabinets and trim, gas fireplace, large open living and dining areas, offset kitchen features solid surface counters and stainless steel appliances, and plenty of storage space! Freshly painted inside and out! HOA fee covers gated entrance, clubhouse with storm shelter, and street maintenance.